Before we resume our journey together, I want to tell you that I’m taking a summer break from my blog. What I’m offering instead is an edited version of my 2013 Belizean Adventure, making the text shorter and providing some never before seen pictures. So sit back and relax and enjoy your visit. So, we are back on Caye Caulker comfortably ensconced in the second- story apartment at the Oasi, a chic open-concept apartment with a living-room futon and coffee table and T.V., full kitchen with gas range, small fridge, ample counter space and kitchen table with chairs and a roomy bright bathroom and a wrap-around verandah complete with a full-length cotton hammock, a small rectangular table with two stools and a table with two clam chair around the corner. My foot is still sore, not painfully so, not that I can’t get around, but I have to be careful how far I walk and I don’t even want to start bicycling. We walked up to the small local airport and watched a couple Tropic Airline 12-seater propeller planes fly in from San Pedro and Belize City, and take off again, picking up and off-loading their human cargo. Now it is time to re-explore the island. 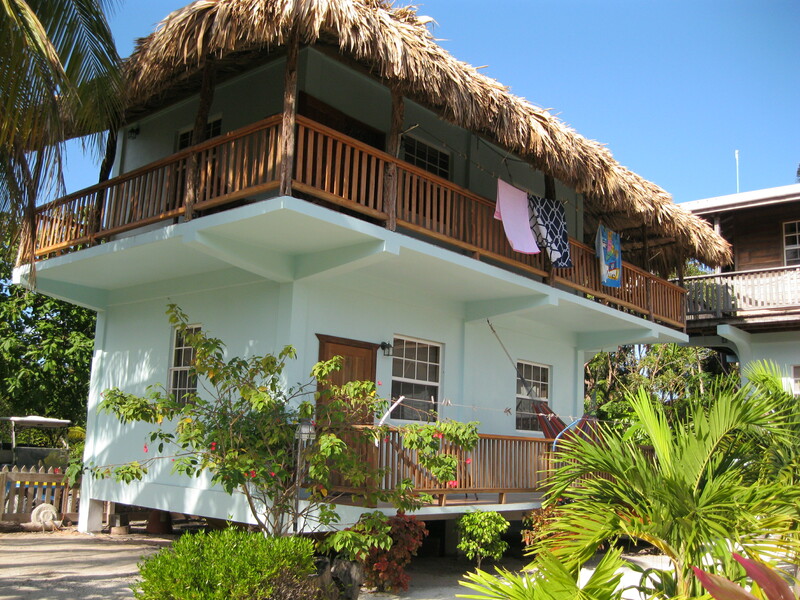 Caye Caulker is approx. 5 miles long and 1.5 miles wide. Check out http://www.cayecaulker.com for more details. Suffice it sufficient for me to tell you that it has grown incredibly from the first time we visited 13 years ago to now. Not in settled population, around 2000, nor in tourists as far as we can tell, but in hotels and restaurants opened on the premise ‘if you build it they will come’. And they probably will but right now it is still under-crowded during the week and it still has it old-time charm. We make manageable forays into ‘town’ to get foodstuffs for our visit. We walk to the nearest grocery store to us, the China Town Super Market. 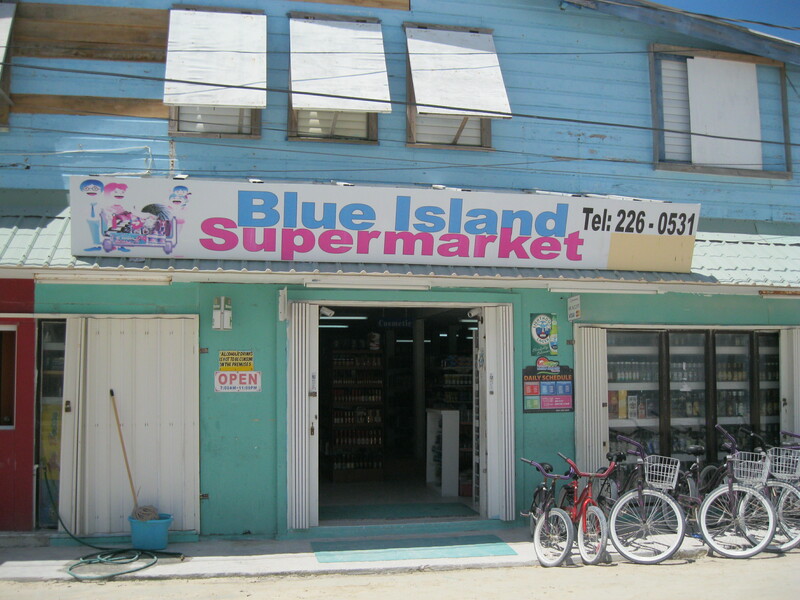 Most grocery stores in Belize, Chinese or not, claim Super Store status. Don’t get your hopes up. China Town provides us with most of our needs, canned and dry goods, rum and miscellaneous items. For baked goods there is a great bakery not far away (nothing is) with fresh breads, buns and sweet buns and pastry-wrapped sausage and ham and cheese. For chicken, there is the store next to the bakery that sells whole chicken and cut -up parts. 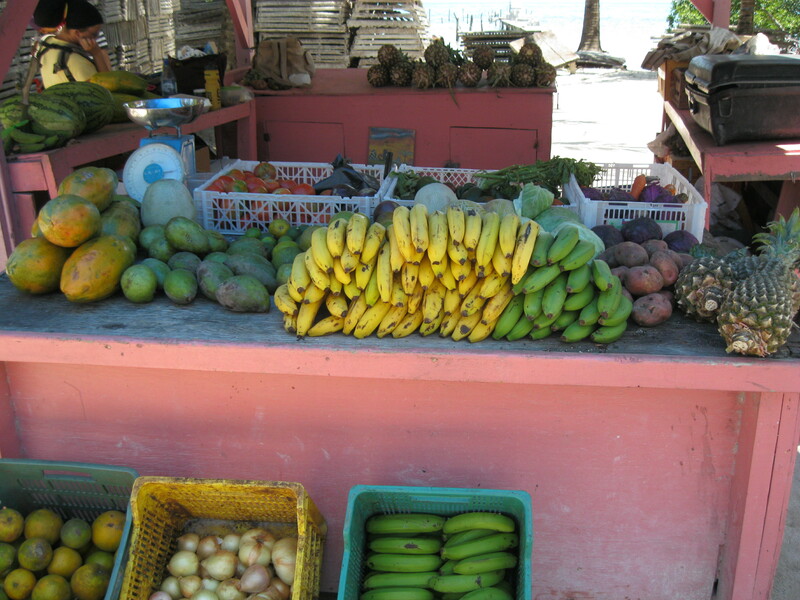 For vegetables, there are kiosks specializing in vegetables and often offering fresh juices like orange, lime, pineapple, papaya and watermelon. For fish and meats we visit Land and Sea for pork chops, pork roasts, breakfast sausage, hot italian sausage, shrimps and fresh catch if we can get it. You can order such things as leg of lamb from Maria, the owner, and she will arrange to have it delivered from Belize City. We shop them all, one by one, stocking up, but knowing that we don’t have far to go to replenish our stock. The roads around the island are a mixture of sand and pulverized coral and shell which when leveled and rolled are very good. When not regularly cared for, however, what with some heavy rains and heavy-duty trucks brought in to haul cement and such-like, the roads get pitted and pot-holed, making for some bumpy bike rides. We are lucky this trip because a municipal election is coming up so a grader and huge roller have been brought in from the mainland and the roads have been leveled. The people are mainly Mestitzos, a creole mixture of Spanish and Mayans, plus every other racial group in Belize, plus a goodly number of Chinese entrepreneurs, plus a cadre of Jamaican rastafarians, plus a burgeoning number of North American ex-pats who are changing the landscape of Caye Caulker, plus tourists and travelers from around the world. It is a friendly and fluid society that by and large gets along very well with one another. We swim daily at the split, a popular swimming area on the north end of the island unencumbered by the docks that spike out from the shore into the se from the many hotels and condominiums that have recently been built. The split is almost a cul de sac of sea water, safe and clean and beautifully coloured with many-nuanced shades of blue and green, topped from time to time by frothy white caps as the tide rolls in. 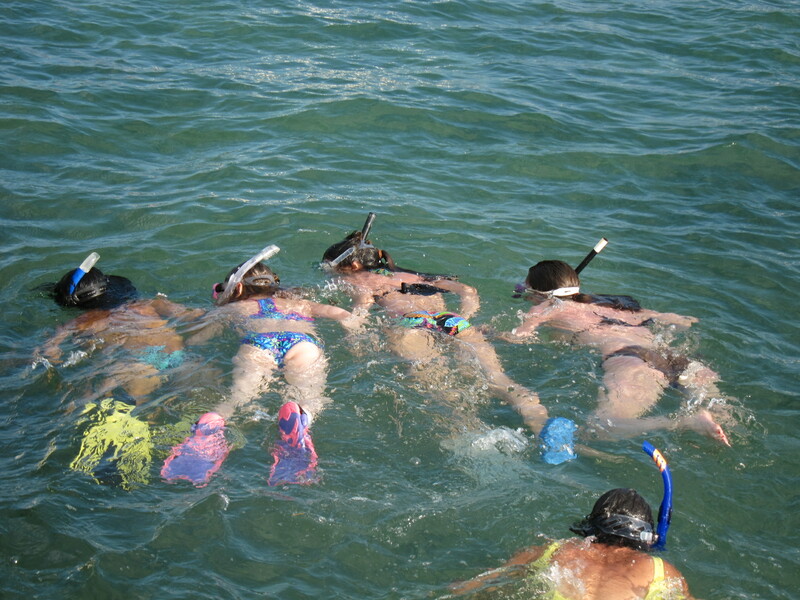 We snorkel there just for fun in water not much over our heads, snatching shells from the sandy bottom and sea stars that we touch and release, often watching young barracuda or silver snappers glide beneath us. Afterwards, toweling off and catching some rays, we watch athletic wind-surfers and kite boarders decorate the skyline with the wild colour of their sails. Later, after a shower to wash away the salt, we lunch in or lunch out, read a little, maybe write a little, maybe work on a sudoku or a cross-word puzzle, maybe nap, and then, before you know it, it’s time for a sun-downer, and, remember, the curtain in the tropics comes down fast. It is dark by 6:30. Supper? Sometime we eat out, more often we eat in. 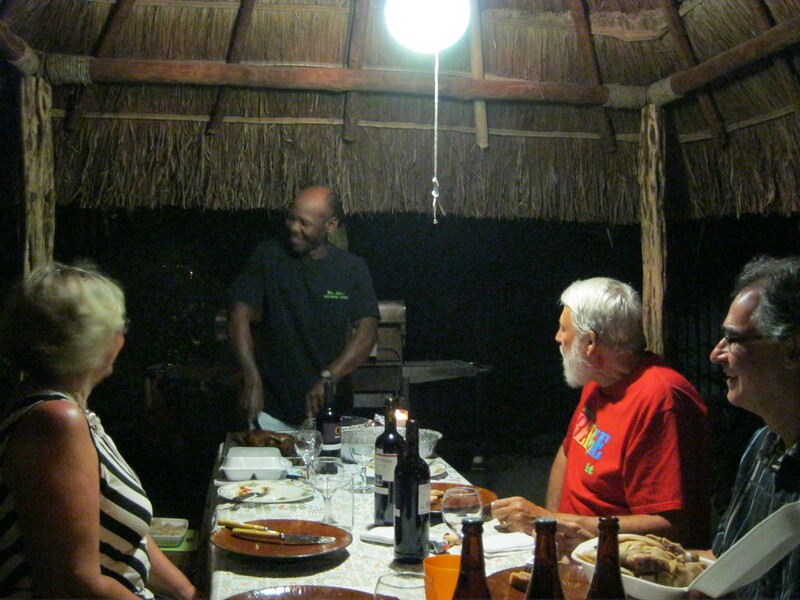 With a full kitchen, we can create extraordinary dishes and we do, but we also have the option to use the communal barbeque and eat our dishes under the lighted palapa in the front yard. And the days and nights dreamily drift by. Check out my book based on my experiences in Belize. It is called Belize Sextet, 7 Tales of Adventure, Travel Noir Fiction, available at www.amazon.com, www.xlibris.com, www.barnesandnoble.com and many other international publishers. Search Books, Fiction, Travel/Adventure or Title and Author, Brian Babineau. Or get a signed copy from Laurelreedbooks, see info on right. Or email me directly at babineb@silomail.com for payment and shipping info. 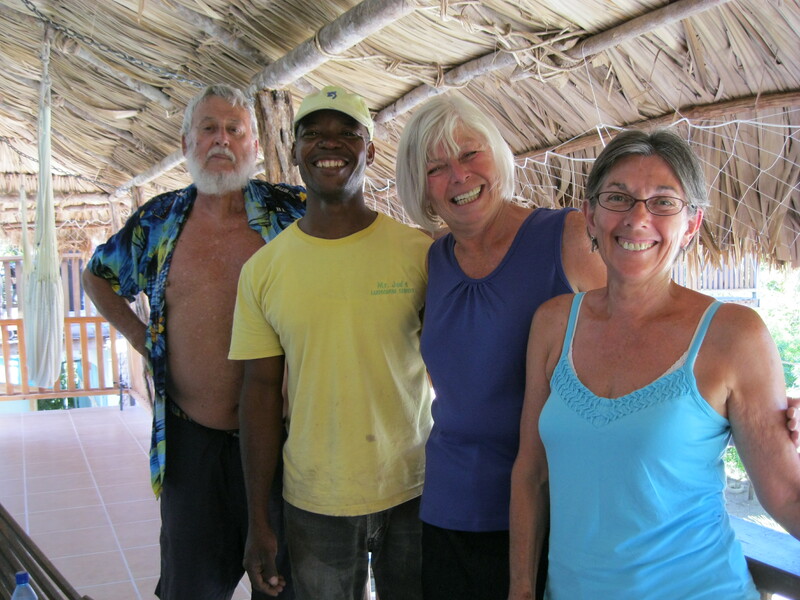 Now back to Belize Adventure 2013, Parts 1-6 which I posted last March. I’m taking a summer break right now so I have edited my 2013 Belize Adventure, making it shorter and added pictures which are being posted for the first time. Sit back and enjoy my trip with me. On the road again. 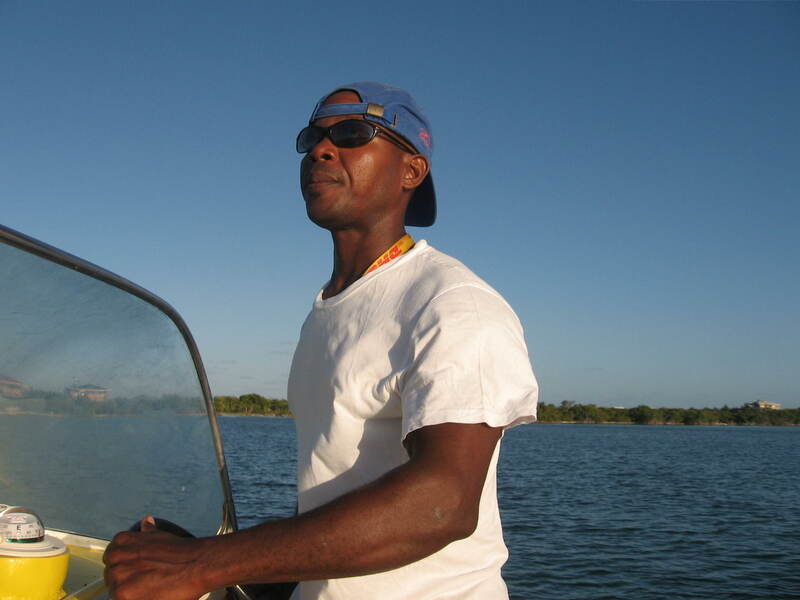 Greg takes us into Dangriga after heart-felt goodbyes to Rita. 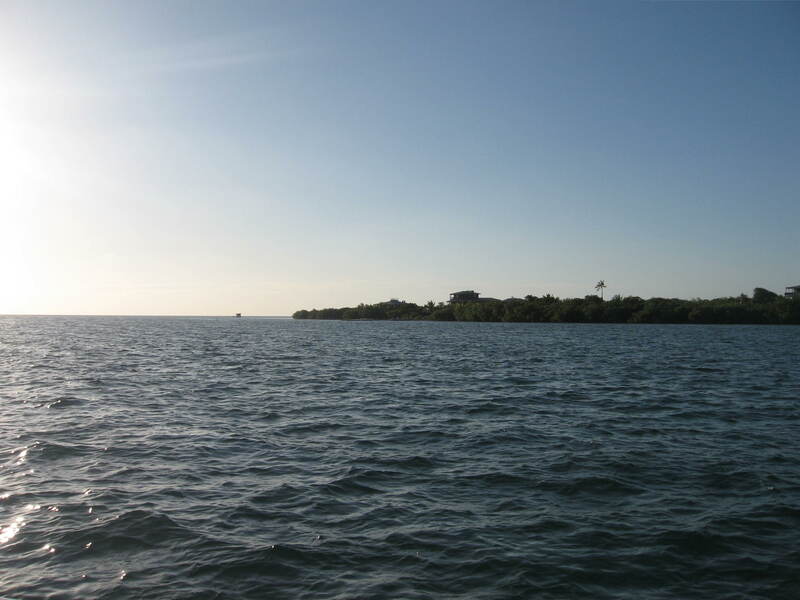 We get the express from Dangriga to Belize City with a quick stop at Belmopan. The bus has seen better days but at least it is not a rickety old Blue Bird. Lots of luggage room in compartments under the seats so we don’t have the hassle of trying to get our backpacks in the racks above us. Only downside is that the large windows are tinted so you don’t get the full colour of the trip up the Hummingbird Highway. On the upside, however, the trip only cost 16 bze each or 8 usd and it takes 1 1/2 hours instead of the normal 3 hours on the milk run. Cutting through the city to the Novello Bus Station on Canal Street we notice a lot of construction on the infrastructure of the city, canals being widened and sanitized, sidewalks and roads being dug up to lay new water lines and plastic piping stretched with cables, but all the buildings look dirt poor and the store fronts are covered with red dust. Now if all the bad boys would stop killing themselves and co-incidentally stop killing innocent bystanders maybe something likeable will happen to Belize City. At the bus station, we are last off the bus on purpose, last to fetch our luggage, last to exit the station and by that time the frenzy for taxis has just about ended and we easily grab a cab for the water-taxi terminal. 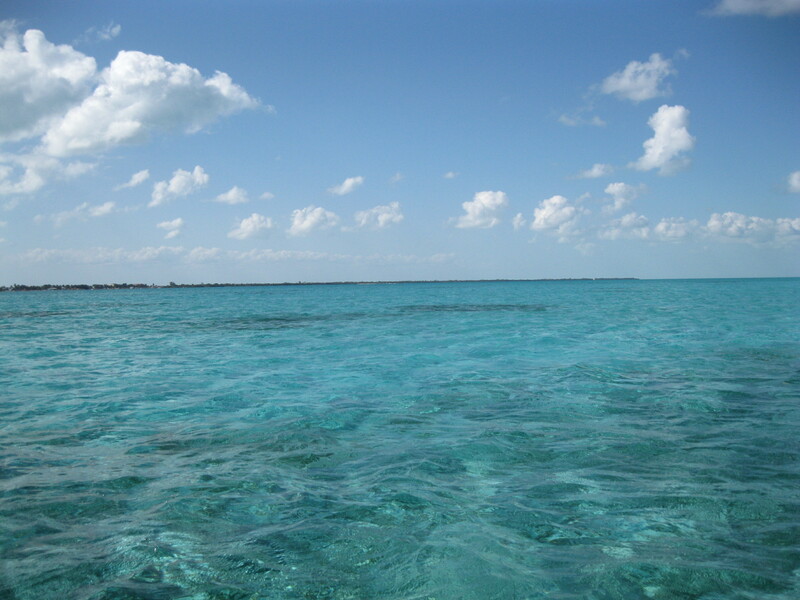 This time we choose the San Pedro Water Taxi over the Caye Caulker Water Taxi because of its schedule. It will get us to Caye Caulker faster. We get return tickets at 32 bze or 16 usd each and after a 25 minute wait we are sitting at the open back of a water-taxi powered by 3 200hp engines, skimming over the waves of the multi-shaded blues of the Caribbean Sea, sea-froth sprinkling us as we shift and turn under the Captain’s control. 45 minutes later we see the shoreline of Caye Caulker come into view, and as we get closer and closer we can identify the hotels and restaurants that lay claim to the beach front. Nick of Nick’s Taxi Service, proud owner of a brand new battery-driven golf cart, is there to greet us when we disembark and ten bumpy minutes later he drops us off at the Oasi, a veritable oasis on Mangle Avenue, one block away from the Caribbean. It is great to be back on Caye Caulker after being away for nearly a year. CC is a mid-sized island, south west of its big sister Ambergris Caye and its capital San Pedro, 1/2 an hour away by water-taxi. Over the 10+ years we have been visiting CC, it has changed dramatically, not always for the better, in our opinion, but you can’t stop change. You don’t have to embrace it but you have to accept it. Or not visit it. As we bump along on our golf-cart taxi, I feel elated. The colours and textures remain the same and the vibe is up-beat. 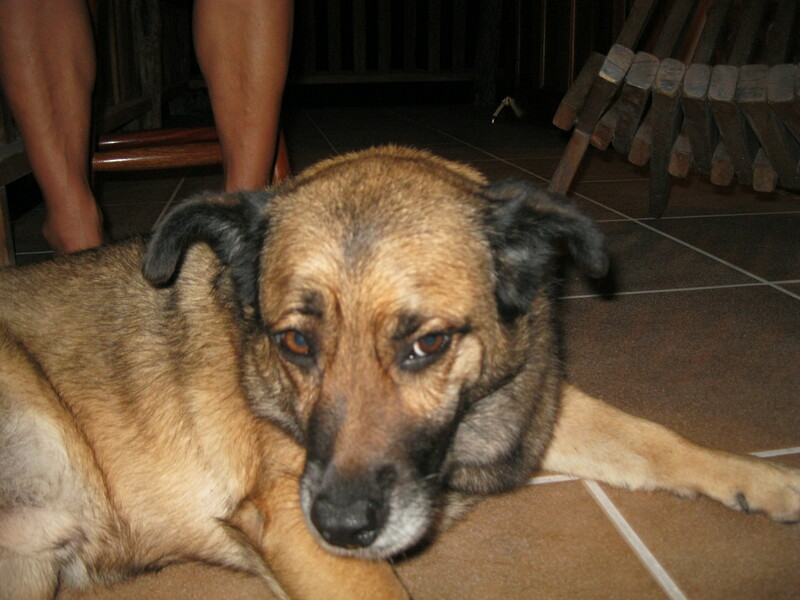 Luciana, the Italian owner/manager of the Oasis Apartments has been waiting for us and we are welcomed home. Her Belizean partner, Michael, owns and operates a landscaping business and also manages properties and residences when the owners have returned to their country of origin. Together they make a formidable couple, a dynamic duo. We settle into the cabana or apartment above the cabana below. It is spacious and beautifully appointed, an open- concept room with a queen- size bed, a large orange futon with sturdy wicker ends, a coffee table reminiscent of the tables Judd in Waterford used to make, a TV, a large armoire, a kitchen table and a full kitchen, and, of course, a full bathroom, which is not open-concept. It is air-conditioned but we rarely use it unless it gets so hot it is stupid not to. It is hot on the island when we arrive. The Oasi is a block from the sea so we don’t get the constant sea-breeze to refresh us. But upstairs in our cabana we get a steady breeze when we sit on our wrap-around verandah. We are hungry and walk up Mangle Ave to the nearest local restaurant where Evelyn orders quesadillas and I order a fish (red-snapper) burger which arrives with a mountain of salad on top . It is delicious. Evelyn says her cheese quesidilla is good too. On the way back from lunch, I admit to Evelyn that my right foot is aching. Before we left Hopkins my foot was hurt in an incident that I will describe in a later blog. Because it was still hurting quite a bit, we didn’t wander far from home and didn’t even take our bikes out (provided courtesy of the Oaisi) for several days. But not to worry. We were able to shop for groceries. Michael picked up a case of Belikin beer for us prior to our arrival and I bought a 60 oz (1.75 litre) bottle of One Barrel Rum from one of the Chinese Super Stores for $30bze which translates into $15cdn. Not a bad price and not a bad drink (with water) for an old man with a sore foot, eh?